Events are a huge part of getting new customers to work with your company for many small businesses. That’s true of all sorts of companies, from art galleries to car dealerships to service-based businesses like landscape designers and insurance agencies. Knowing how to design and create an invitation mailing successfully can be tricky, however. In fact, most small business owners really don’t take advantage of invitation mailings as successfully as they could. Use this guide to help you create invitation mailing cards, letters and e-mails that will attract new customers and bring existing customers to your most important events. When you’re designing invitation mailers, for print or e-mail, clarity is of the utmost importance. The person receiving your invitation needs all of the basic information in an easy-to-read, obvious format. If the invitation is confusing, you’ll have fewer attendees. Invitations should repeat your business name, the time, address, and date of the event, as well as why the event is being held, at the top and bottom of the message. 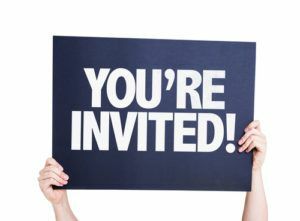 Many small business owners don’t use printed invitations anymore, but the truth is that they can be very effective. Most people are overloaded with e-mail, and many simply put messages not from friends and family in the trash without reading them. Print invitations will get more people to your event, because more people will actually see and read the invitation. Postcards are an ideal way to send invitations through the mail without spending a fortune. Consider including a link to an online RSVP form to make it easy for your recipients to reply. Here’s an example that utilizes online and a mailed back RSVP. Every savvy small business owner is using e-mail for event invitations these days, even if they also use print invitations. This double-pronged invitation style is ideal for actually getting new customers and existing customers to come to your location for an in-person event. To get the most out of e-mail invitations, though, you need to give your customers advance notice about an event. Send your actual invite about three to four weeks before the event is scheduled. Follow up with your customers a few days before the event as a reminder, especially if you’re taking RSVPs.